Over the months, we met with Alli and her sweet mama, Donna, to hone in on specifics and make a plan. Alli had what I thought was a great idea: to reuse her seven bridesmaids' bouquets at the reception as guest table centerpieces. (Later on, at the end of the school year, Alli's students surprised her with glass rose bowls to pull this off.) I was excited that the bouquets would be used as centerpieces instead of plopped down to wilt and be forgotten. 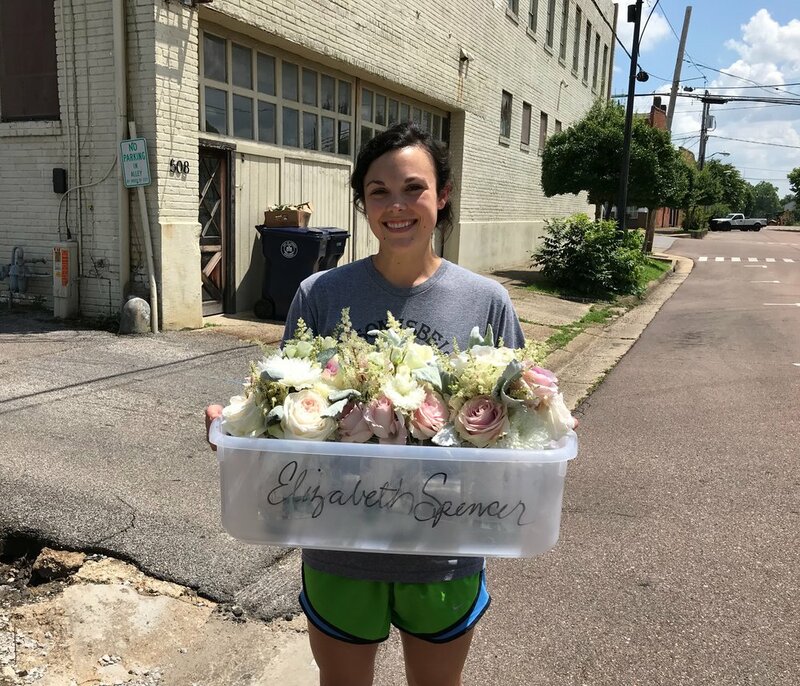 Alli and her mama wanted to reuse these arrangements at the reception, so they had groomsmen transport the urns to Franklin Courtyard during a special "send-off" as the new Dr. and Mrs. exited the chapel. Doubling as a great photo op, I thought this little maneuver was genius. In order to accommodate Alli's plan, we made one arrangement (the one on the right) "in the round" so that it could go on the double-sided food table and be seen from all sides at Franklin Courtyard. The other had a "back" and was moved to a table against a wall. Aside from these beauties, a little greenery and white double-faced satin ribbon out front completed the floral decor for the chapel. 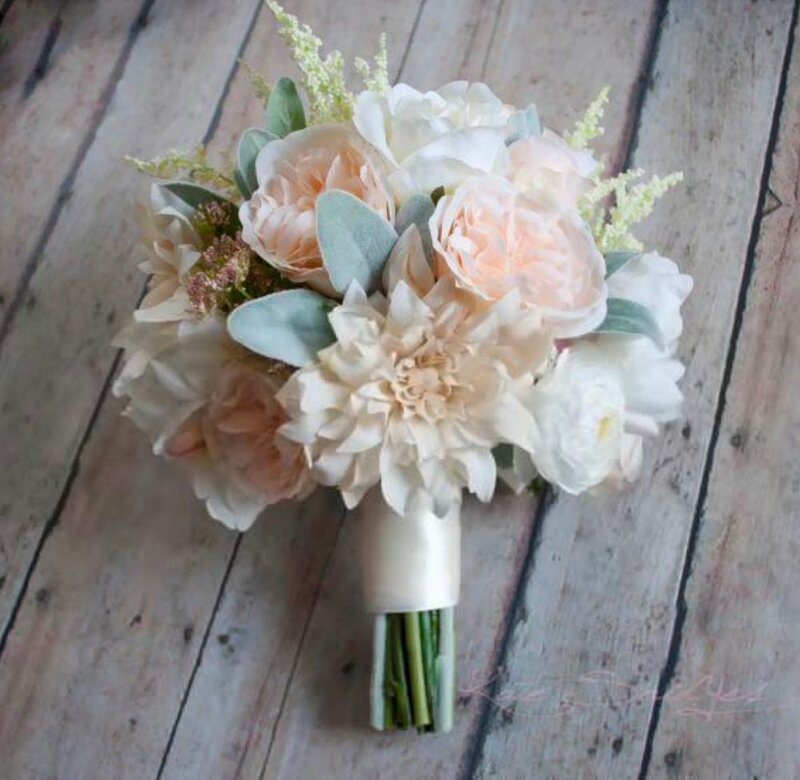 As for what we like to call "people flowers" that make their debut at the ceremony, we started with an inspiration photo of a beautiful bouquet that Alli had pinned. 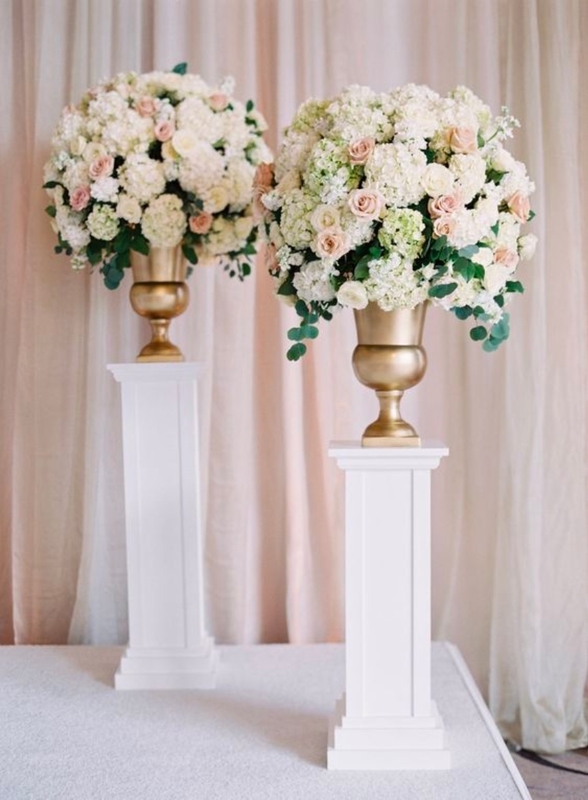 It consisted of creamy dahlias, garden roses, dusty miller, white ranunculus and white astilbe. Though dahlias are hard to come by in late June, our wholesaler was able to locate enough for Alli and her bridesmaids' bouquets. However, on the truck somewhere between California and Corinth, our hamper of in-demand creamy dahlias was STOLEN! This was a first for my mom and me, and we — along with our wholesaler — were helpless in the matter. To get a similar look choosing from what our wholesaler had in stock, we bought white chrysanthemums. I was skeptical at first, but once we started arranging, I realized that the texture they contributed was just right. Check out our inspiration and one of our bouquets side by side below. Which do you like better? We'd love to hear your thoughts in the comments section below! Our inspiration for bridal and bridesmaids' bouquets, down to the white double-faced satin wrapping the stems. We were thrilled with how the bouquets turned out — those pastels! They were sweet, traditional, and downright luxurious with all those petals. In fact, I liked them so much that they appeared in my dream that Friday night before the ceremony. However, in my anxiety-ridden sleep (deep z's elude me during wedding weekends no matter how calm and in-control I feel about the job), the circular, flesh-colored "faces" of the garden roses were REAL faces staring at me. Do you see where I'm coming from? It's just so hard to keep your eyes off that peachy beauty... Alli herself told us she couldn't stop staring at the flowers! We made arrangements in varying glass vases for the guest tables at Alli's reception that wouldn't have a bridesmaid's bouquet as a centerpiece. These containers — as well as the white table cloths and assorted gold votives pictured below — all came from SoCo Event Rentals. Finally, we gave our "Welcome" sign a hand-painted update. Placing a bit of greenery on it as well as Alli's registration and favor tables was our final touch. We left the cake lady, Lisa Overby, plenty of garnish and hoped that the night would go off without a hitch. Good luck and best wishes, Dr. and Mrs. Harber! We were thrilled to be a part of this sweet celebration. From the get-go, Alli and Donna were great to work with — the absolute best clients in so many ways. My mom and I had a great time choosing and working with Alli's luscious flowers. Yet again we were reminded what a dream — barring my creepy, rose-face conjure — it is that we get to do this for a living. Scroll through below to see more photos from Alli and Dan's big day.